Patients with gum disease are usually unaware of the early signs. As the disease progresses and gums become more inflamed, gum disease can lead to severe damage and place patients at greater risk for more consequential medical conditions. 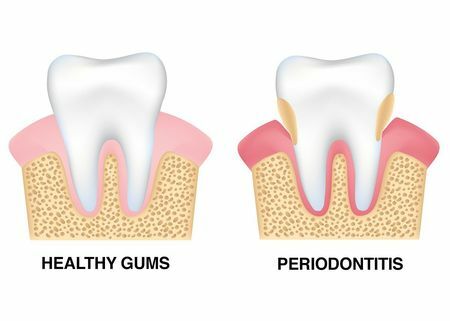 While the early stages of gum disease are easily treatable and often reversible, once it develops into periodontitis, the disease is incurable and requires ongoing treatment to stop its advancement. Dr. Teddi Olszewski provides periodontal care at our Northampton, MA, dental practice to help patients maintain their healthy smiles. Gum disease, also known as periodontal disease, is a bacterial infection that affects both the soft and hard tissues of the jaw. As the bacteria develop below the gum line, teeth will decay at the base of the tooth. If left untreated, gum disease can result in tooth loss, bone degeneration, and the need for complex and costly restorative treatments. In more severe cases, gum disease can impact your physical health. According to the Centers for Disease Control and Prevention, almost half of American adults over the age of 30 have some form of gum disease. Almost half of American adults over the age of 30 have some form of gum disease. Heart Disease: The inflammation caused by gum disease has been connected to the development of heart disease and known to exacerbate existing heart conditions. Diabetes: Gum disease and diabetes are frequently linked. Those with diabetes have a weakened immune system and are more susceptible to infection. Gum disease can also cause increased blood sugar levels, which places patients at risk for diabetes. Oral Cancer: Unaddressed infection and increased inflammation in the mouth can place patients at greater risk for oral cancer. Dr. Olszewski provides oral cancer screenings for early detection. Rheumatoid Arthritis: Increased inflammation within the body can lead to joint immobility and stiffness. According to the Arthritis Foundation, a connection has been drawn between rheumatoid arthritis and gum disease. Lung Disease: Studies have shown that individuals with gum disease have a higher chance of developing lung cancer. Those who smoke, drink alcohol in excess, and have diabetes are at an even greater risk. Gingivitis: At this stage, gums may appear red and inflamed and bad breath may be an issue. Side effects are generally treatable through an in-office deep cleaning and special antibacterial mouthwash. Gum Disease: As the disease progresses, it can cause gums to recede and infection to develop deep below the gum line. Symptoms are more apparent and may include dental sensitivity and red, bleeding gums. The disease cannot be cured at this stage, but is treatable with a scaling and root planing treatment. This will involve removing unhealthy bacteria below the gum line and from the base of the tooth to prevent the infection from spreading. Periodontitis: Gum surgery and bone grafting are typically necessary at this stage to remove the diseased tissue and correct bone loss. In some cases, tooth extraction is required to prevent further damage to surrounding teeth. Dr. Olszewski will recommend conservative treatment first when possible. If you are concerned you may have gum disease, it is important that you schedule an appointment with Dr. Olszewski to help protect the health of your teeth and gums. Contact our office online or call Northampton Family & Cosmetic Dentistry at (413) 584-2902. We will be glad to schedule your visit.